The Charter Square construction site seen from City Plaza. This is the first tower of the two-tower project. Getting there!!! Any word on when they’ll start Tower 2? I’ve heard rumors that they wanted to get it going as soon as Tower 1 is finished. Someone correct me if I heard wrong. They are about 1/3 done. I guess this project will be moving fast enough to top out long before the end of the year. I like what I see in the rendering and I hope this building will look nice enough in real life. At least we no longer have an entire empty lot to look at. Hopefully, there will be demand to justify a North Tower taller than 20 floors. If the latter is LEED certified it will be really nice. Is there an artist rendering of the second tower? If so where can I go to see it? They said they will not be making any serious moves on the other tower until they are at 60% filled. Last check they were filled at 45%. With the Edison office up to 19 stories and making a push to build sooner rather than later, it may be delayed. With class A space being at its lowest point we can hope everyone fills up fast so they can move forward. Overall, we are seeing some major projects and DTR fans should be ecstatic after the lulls of the last five years. Is it just me, or does that crane look too short to build 11 stories that size without being adjusted? Marco: Well, 45% is something! I’m thinking the Edison office is going up taller than originally planned because of demand for office space, so hopefully they’ll be full by the time C.S. tower 1 is finished? Any word on when exactly they want to start building the Edison? Jeff: I can see what you’re saying, but I’m sure the perspective from the ground is very different than if you were looking at it straight on. Don’t get your hopes up- I’m thinking Tower 1 will be just about as tall as the crane. But now think double that or possibly more for Tower 2! Now that’s something to be excited about! @Jake Anthony: I think that the push for the Edison office building came from the addition of a 6-story parking deck, not because of demand. This is also what “scares” me because the 19-story version submitted for review wasn’t really for the approval of the size, but other things. Anyway, I will need to double check that, but I am pretty certain this is where the increase came from. I hope there is need for more space, and that goes for both Edison and Charter Square (North Tower). For the latter, I have high expectations, especially if they go with LEED certification, like they did with the South Tower. A LEED-certified 20-story can easily look like a 23-25 story building, which would be a nice infill high-rise. While not impressed with the height of the South Tower, I am happy to see that a developer gets bold by adding speculative space, plus the final height is a bit taller than the original plan. Has anyone heard anything about RFPs for Sites 2 and 3? Marco , Your news on the 45% leasing of the North Tower really excites me . Sounds so good ! ^Ernest: Great information, thanks. I’ve heard rumors that Charter Square North Tower would be close in height to the Wells Fargo building, which would be amazing if true. Sorry for any confusion about the 45%. Specifically what the Charter Square team said was that the south tower was ~45% filled and they would not begin any serious moves on the north tower until the south tower was at 60% filled. All. My apologies if I confused anyone about the 45%. Specifically, the Charter Square team said was that the south tower was ~45% filled and that they would not be making any serious moves on the north tower until they hit ~60% (more or less). Considering this is true speculative space it is understandable. @Jake Anthony: Thanks for the update. Hopefully that rumor will be true. I would think that something around that height would have an impact on the skyline and add to its density. I am not a big fan of linear skylines, but I will take something like that ANY day. I can’t wait for the day when high-rise development (above 400ft, of course) will expand to the West, along Salisbury (West side of the street), McDowell and Dawson streets. If Charter Square (South Tower) is 45% pre-leased, then we can be hopeful. If I owned/managed a company and planned a move to DT Raleigh, I would surely like to see the offices instead of leasing them before they are built. Speculative space is no longer a viable solution for most developers, but sometimes it is worth the risk. DT Raleigh is a good place for that, particularly in the mid-rise market (below 15 floors, using my standards). Let’s keep our fingers crossed that Charter Square becomes a success story. The city council should reject it and have them delivery what they proposed with the newer design. It’s too much slight of hand by these developers. First the Edison proposal and what was delivered now this. Raleigh shouldn’t have to settle. Sorry my comment was a response directed to Dwight Nipper regarding the Summit Group Hotel proposal. Agree with Unique 1. problem is, to many dirty city council members getting kick backs supporting these pathetic local developers who have no vision what-so-ever! 11 stories would certainly be a better use of the space. I like the rendering for this 9 story model better than the old one though. The 11 story design was quite ugly. If they do stick with 11 stories, I hope they update it. I like the 9 story version better myself. Make that design 11 stories. Passed by site today. Very small site. It’s an ok hotel for such a small site IMO. We need a lot more hotel rooms DT. this will help. We all must remember what was being built a year ago. Nothing. I am hopefull that this round of development will lead the way for bigger and better things to come. We can only hope. 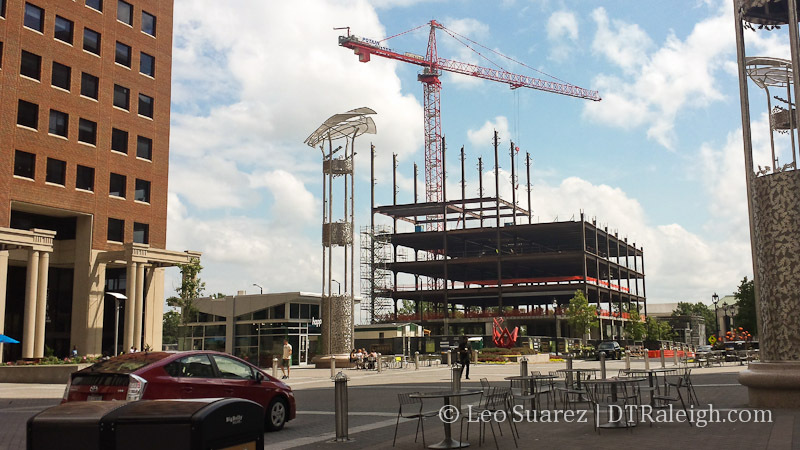 Adrian – (~)a year ago, we had projects like the BEAUTIFUL secu building/science center addition, we had the relatively tall Quorum center (which I believe was built over a year ago, and other small projects. Yes, we do have a lot more development going on now, but that does not mean Raleigh should settle for mediocrity. The original 11 story version was ugly as hell, whereas this one is decent looking but much shorter. Why not come up with a marriage of the two? Why not expect something tall AND nice looking? Why does Raleigh, you know, one of the FASTEST growing cities in the US, have to settle for one OR the other? I agree that the two designs should be combined. 11 stories with new design. I just don’t think a two story difference is a very big deal. Charter Square is going up. That and the north tower(hopefully over 25 floors) are good signs. The Skyhouse and a taller Edison office building are great signs. Cup 3/4 full IMO. I would go higher on my percentage but we got screwed on the rest of the Edison. I was in Coopers yesterday. To think they knocked down a Raleigh Classic for that! The new place is nice but not the same! I agree with Adrian on that, But the second tower should be at least 25 stories tall.You have three high rises and a forth one being built. Another High rise wouldn’t hurt. It would make a pleasing sight from a distance coming into Downtown Raleigh. Anyone heard any news about the design of tower 2 recently? I wish someone would release a rendering already. Also, where can I find out an updated number of how much of the South Tower is pre-leased? Thanks Nick for the info. on the web camera showing Charter Square & SkyHouse . Great ! Wanted to pass this info. I goggle “BidClerk Projects Raleigh NC” , clicked on hotels/motels & I got this info. 11-story hotel , 150 rms. ,roof top terrace , 1000 space parking deck , estimated start date of 4-6-15 . Project revised on 9-26-14 . This sounds good to me .